Edinburgh, during the Fringe. is an international hub of performers & punters, truly the greatest festival of its kind on the planet. 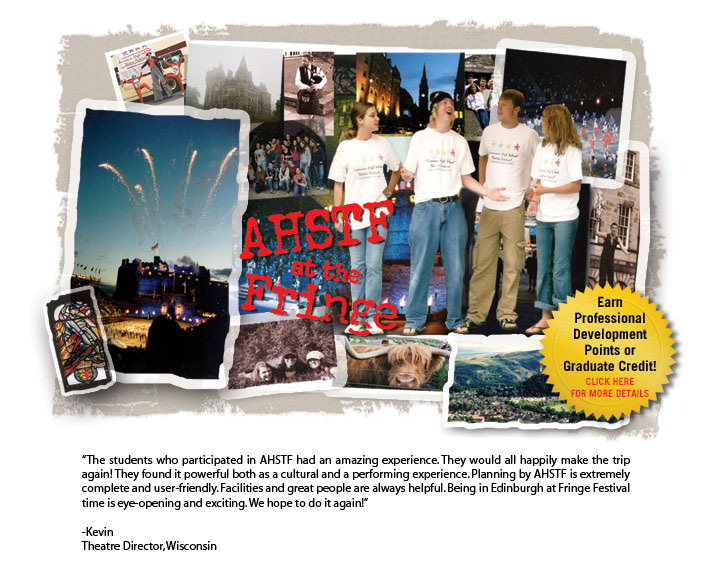 In recent years, it has welcomed the cream of America’s Glee clubs, through the conduit that is the American High School Theatre Festival. Thjis year. 42 different shows are being presented across three stages – two at Church Hill theatre, & one at Pilrig Studio. This burgeoning blossom of talent is drawn from High Schools all across North America, a dazzling array of talent among which are surely the Hollywood Stars of the future. You can get their full programme here. Living not far from Pilrig Studio, I went to check out ZOMBIE PROM , from Beloit Memorial High School, Wisconsin. A delightful performance set in the 1960’s, the story is of a bad-boy youth driven to suicide by the dissaproving parents of his girlfriend. His method was to throw himself into nuclear waste, out of which he rose covered in toxic gunk a few weeks later, just in time for the prom. The music was pre-recorded, whose funky big-band swing kept the vibe buzzing along nicely. A great performance, whose star I thought to be Kolten Bell, whose mature & confident air pulled off the shows Eddie Flagrante with aplomb. All shows only run for four days, & this one finishes tomorrow, so catch it while you can. But if you dont, there’s another 41 to choose from!